Debido a restricciones por parte del fabricante no podemos enviarle este artículo. Teva products to the European Union. 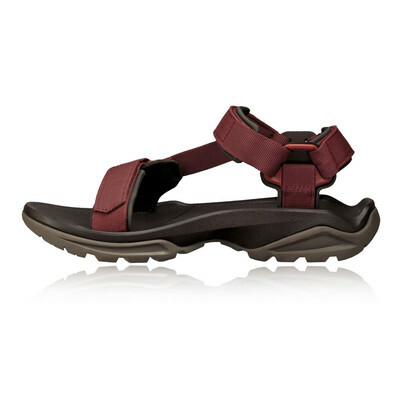 "Teva sandals are hard wearing and comfortable for walking in." "Perfect fit and at a discounted price. First time Iâ? ?ve tried this model of sandals and there great on your feet from the word go. Highly recommended. Perfect for warm weather hikes and adventures, the Teva Terra FI 4 Walking Sandals includes a rugged shock absorbent heel to keep your foot supported while a durable strapping system keeps them in place. If you are looking for a strong pair of technical sandals which will keep your feet feeling fresh wherever you venture, then look no further than the Teva Terra FI 4. 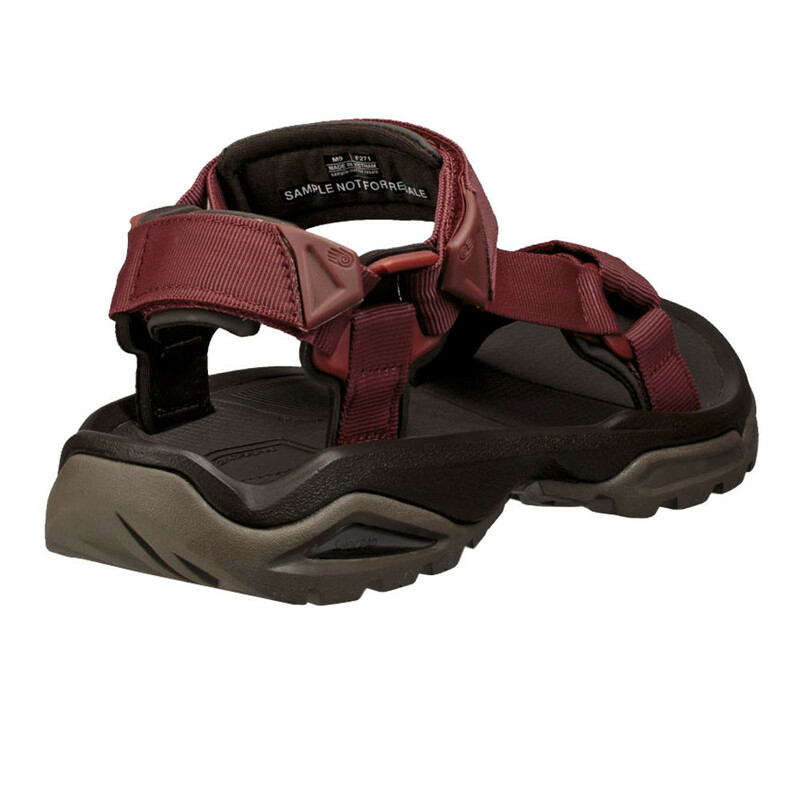 The Teva Terra FI 4 Walking Sandals are made with an open toe construction to allow the feet to breathe easily and reduces the risk of pooling which makes them perfect for coastal walking. It's lightweight, quick-drying, webbing upper is equipped with padding around the front and heel to provide maximum comfort to the wearer and also reduce the risk of irritation. 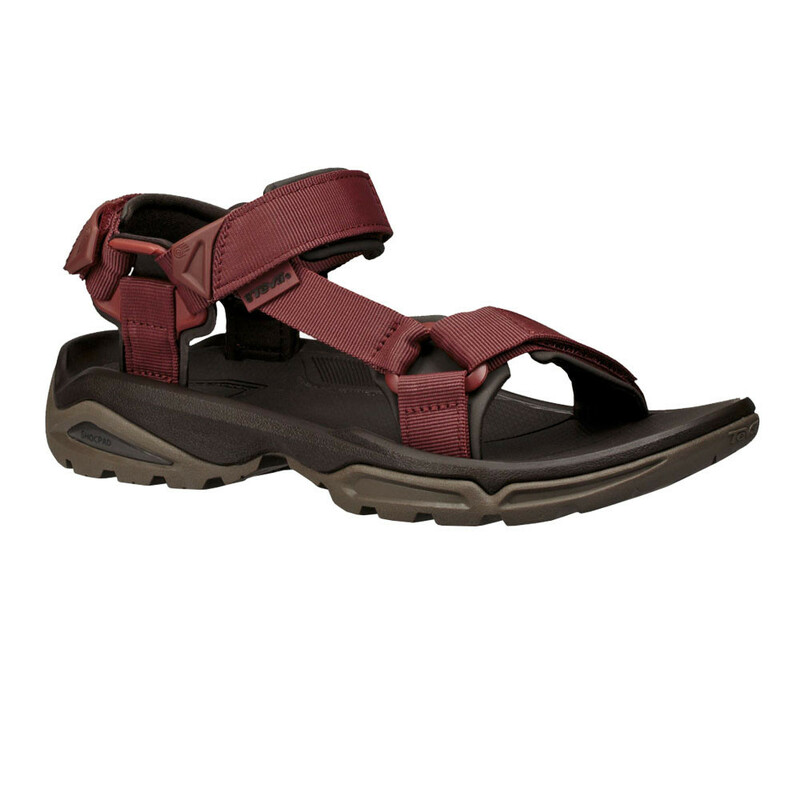 The hook and loop closure on the sandal makes it easy for the wearer to adjust the strap and also makes it easier to get the sandal on and off without any difficulty. The sandal is treated with Microban zinc-based anti-microbial treatment that will help to eliminate odour to keep your feet feeling fresh for longer. The moulded PU midsole provides underfoot cushioning and light support while the nylon shank keeps the foot stable and in control. The plush cushioning in the midsole will give the wearer maximum comfort which will keep you wanting to walk for longer. Equipped with Shoc Pad which is a blended polyurethane/EVA in the heel cup that evenly transfers the energy impact throughout the footbed and away from the heel. This energy return actually provides greater spring with each forefoot push-off. It is designed to soak up impacts from lumps and bumps in the trail or submerged under water. Spider Original Rubber is Teva's original rubber compound, inspired by a spider's ability to climb up vertical, soaking wet rocks. Spider Original does much the same thing: providing good grip at all times and truly exceptional grip on wet surfaces. La Teva Original proviene de principios humildes - una correa de velcro de viejo reloj unido a una sandalia - pero se ha convertido en un icono que habla a las masas. La gente de todo el mundo han aceptado la invitación a la aventura y adoptado " la correa y listo," espontánea, ir a cualquier parte, hacer cualquier cosa que normalmente la sandalia original representa. Teva ahora crea una gama de botas de montaña de alto rendimiento, zapatos y sandalias. Open Toe Construction - Allows ventilation and reduces the risk of pooling. Webbing Upper - Lightweight and quick-drying. 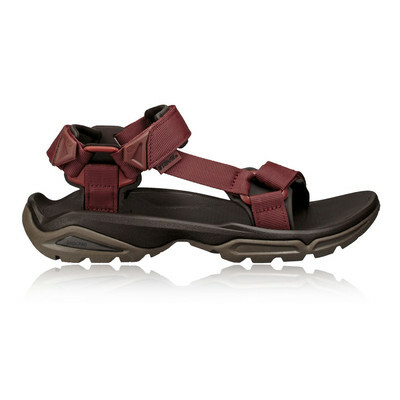 Hook and Loop Closure - Padding around the front and heel provides maximum comfort to the wearer. 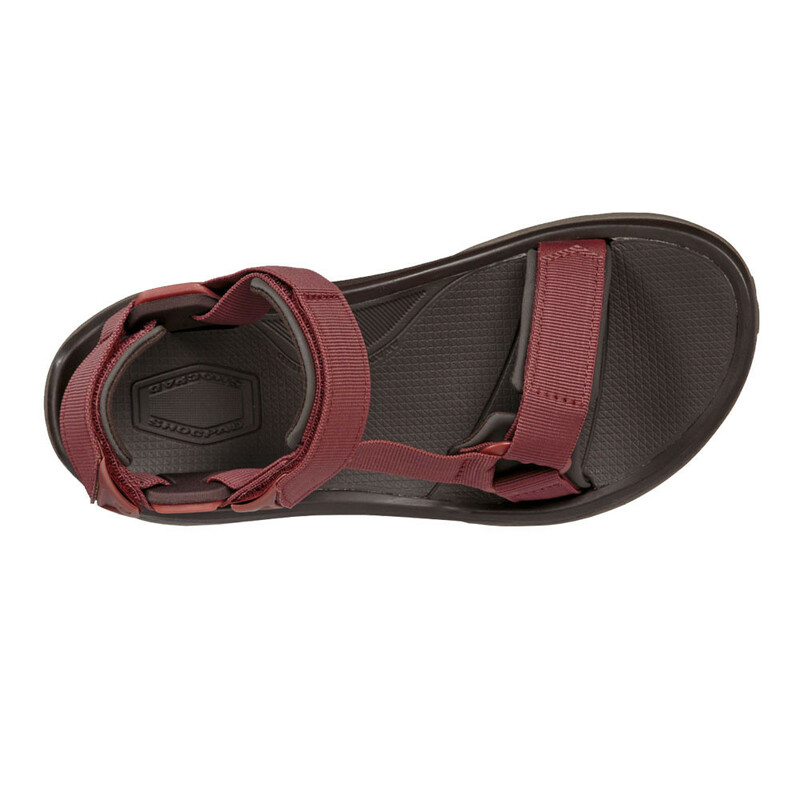 The straps are easy to adjust and the hook and loop closure makes it easy for the sandals to be put on and removed. Microban Zinc-Based Anti-Microbial Treatment - Helps to eliminate odour to keep your feet feeling fresh. Moulded PU Midsole - Provides underfoot cushioning and light support. Nylon Shank - Keeps the foot stable and in control. 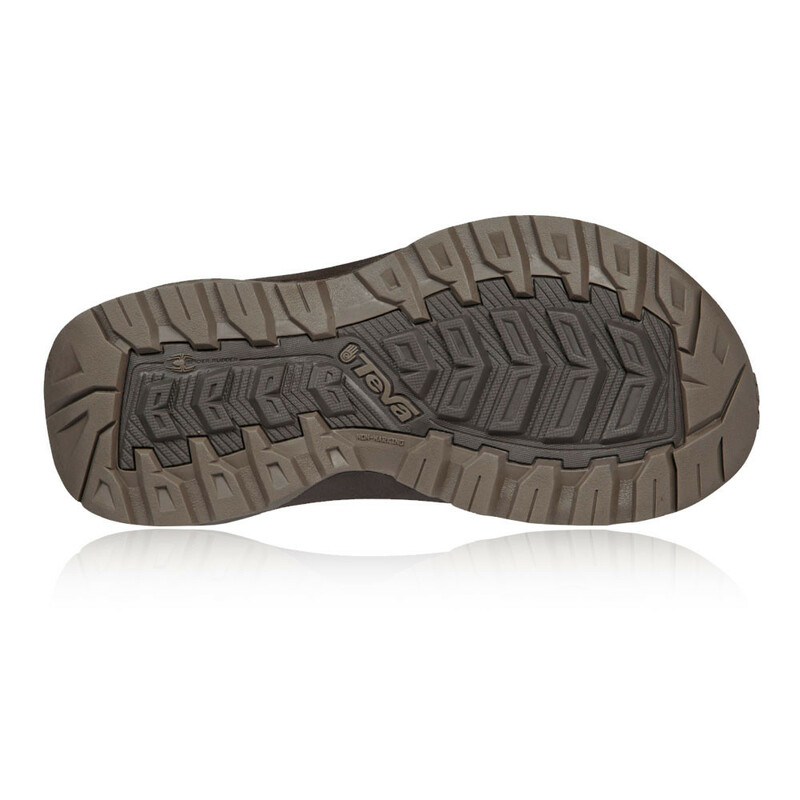 Shoc Pad - Evenly transfers the energy impact throughout the footbed and away from the heel. Spider Original Rubber - Provides good grip at all times and truly exceptional grip on wet surfaces.